I'm sure some of you have heard about a supposedly haunted house attraction the Chimera House or "13 Floor Money Back House" so frightening that no one has been able to complete a full tour of it. Sorry to burst your bubble but this house doesn't exist. It started to circulate among the population around in the mid-1980s. Like most urban legends, there are many variations of this one. However, they have some common links. The location of this house is usually set in the South or Midwest, but it is believed this legend may have started in Kansas City. Some have it located in an actual supernatural location or an abandoned hospital. Rumor also has it that the haunted attraction Britannia Manor may have also been the inspiration for the Chimera House. Today, the Oliver House in Bisbee, Arizona serves as a bed and breakfast to guests of all kinds. In 1909, it was built to accommodate Calumet & Arizona Mining Company executives. Mining tycoon Henry Oliver's wife Edith Ann Oliver oversaw the construction of the 12 room red brick structure in 1908. Since then, it has been a residence, boarding house, and business office. The building may have a pleasant appearance but also a violent past. There have been allegedly 27 deaths (mostly murders) on the property. The actual number can not be verified due to fires destroying historical records. Long lost to the public in out-of-print pulp magazines, dusty Victorian anthologies, and the pages of now defunct newspapers these vintage vampire stories have truly proved immortal. Resurrected now for the year 2011, this is a stunning collection of nineteenth-century vampire stories by heavyweights such as Sabine Baring-Gould and Bram Stoker. 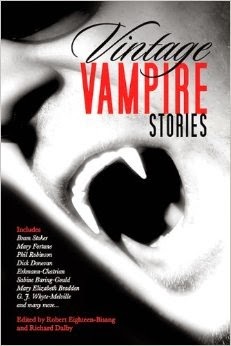 These 15 rare stories are arranged in chronological order from 1846 to 1913 and are compiled by two of the world’s leading vampire anthologists and experts. Also included are rare images of Bram Stoker’s handwritten manuscript pages for Count Vampire (1890) courtesy of the Rosenbach Museum & Library in Philadelphia. Now, it took me awhile to finish this book but I'm finally starting to get caught up on my reviews. This book didn't grasp my attention as much as I would have liked.